Of the roughly 240,000 breast cancer cases diagnosed in the United States, about 80 percent are fueled by the hormone estrogen and known as “ER-positive” breast cancers. Such tumors are more likely to respond to hormone therapy than those that do not have estrogen receptors, or ER. Although most breast cancer tumors express ER, de novo or acquired endocrine resistance is a major limitation of treatment. Ultimately, if ER-positive tumors metastasize they become endocrine resistant. 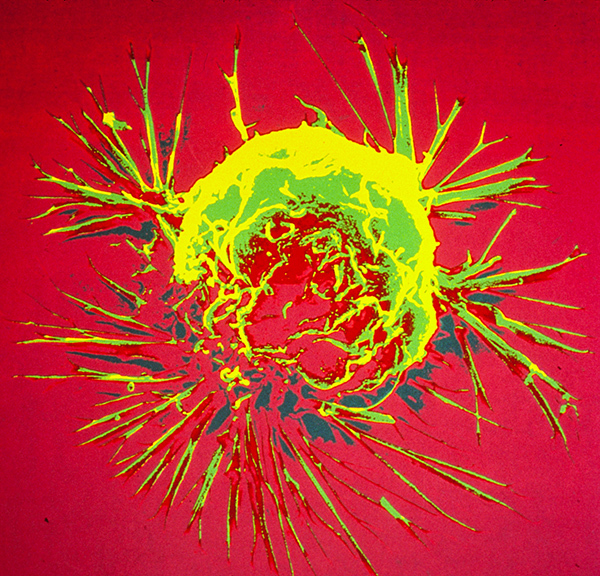 Studies have underscored several cellular mechanisms by which breast cancers develop endocrine resistance: loss of ER expression, increased signaling through growth factor-mediated cell signaling pathways, such as the PI3K/Akt/mTOR pathway and the MAPK pathway, mutations in the genes PIK3CA and ESR1, and FGFR1 and CCND1 amplifications. Our study as well as others have shown that a significant proportion of metastatic breast tumors have decreased ER expression compared with the primary tumor, while at the same time they have increased HER2 expression, indirectly pointing toward these pathways as mechanisms of resistance. Breast cancer cell. Photo source: National Cancer Institute. Researchers have proposed several strategies to overcome resistance. One strategy that has shown promise is mTOR inhibition. The BOLERO-2 trial randomized 724 patients with metastatic breast cancer previously treated with a non-steroidal aromatase inhibitor to receive the aromatase inhibitor, exemestane, with or without the mTOR inhibitor, everolimus. The study confirmed that the progression free survival (PFS), which was the primary endpoint of the trial, was significantly improved in patients who received exemestane and everolimus (7.8 versus 3.2 months respectively). Although there was no significant overall survival (OS) benefit, this treatment was approved by the FDA and is currently considered standard therapy for patients with endocrine resistant breast cancer tumors. Another trial that focused on mTOR inhibition, the TAMRAD trial, randomized patients who had previously received endocrine therapy to tamoxifen with or without the drug everolimus. This trial included 111 patients and showed that the clinical benefit rate at six months, which was the primary endpoint of the trial, was significantly higher in the combination arm (61 percent versus 42 percent, for combined therapy versus tamoxifen alone, respectively). Time to disease progression and OS were also improved with the addition of everolimus. However, another mTOR inhibitor, temsirolimus, did not prove to be efficacious as first line therapy in metastatic breast cancer. Another approach to tackling endocrine resistance is by CDK4/6 inhibition. Data from two recent clinical trials, PALOMA-1 and PALOMA-3, showed an improvement in outcomes with the addition of the drug palbociclib, a CDK4/6 inhibitor, to endocrine therapy. In the PALOMA-1 trial, palbociclib was tested as a first-line therapy in patients with metastatic disease, and in PALOMA-3 it was tested in women whose breast cancer had relapsed or progressed on endocrine therapy. A total of 521 patients were randomized to the hormone therapy fulvestrant with or without palbociclib in PALOMA-3, and preliminary results showed that the median PFS, which was the primary endpoint of the trial, was significantly higher in the palbociclib arm (9.2 months for palbociclib + fulvetrant versus 3.8 months for fulvestrant). This trial shows that CDK4/6 inhibition can be effective in endocrine resistance. Another target researchers are currently testing in clinical trials is the PI3K cell-signaling pathway. Studies have shown that up to 70 percent of breast cancers have alterations in the PI3K pathway and that PIK3CA mutations are very common in ER-positive breast cancers. So far, pan-PI3K inhibitors, such as buparlisib, pictilisib, and SAR245408, have not shown impressive efficacy, whereas PI3K-α-specific inhibition has shown more promise. Future approaches will include combination therapy of mTOR/PI3K inhibition and FGFR inhibition. A combination approach may be beneficial given the fact that in many cases of resistance more than one pathway are responsible for the emergence of resistance. Ongoing clinical trials will help provide biomarkers of response, as well as provide clues to optimal therapy, or combination therapies, to overcome endocrine resistance. Virgina Kaklamani, MD, DSc, is co-director of the San Antonio Breast Cancer Symposium (SABCS), professor of medicine in the Division of Hematology/Oncology at the University of Texas Health Science Center in San Antonio, Texas, and is the leader of the Breast Cancer Program at the Cancer Therapy and Research Center. Kaklamani completed her medical training with honors at the University of Athens and her residency in Internal Medicine at Newton-Wellesley Hospital in Boston, Massachusetts. She completed her fellowship in hematology/oncology at Northwestern University. She also received a Master of Science in Clinical Investigation from Northwestern University. 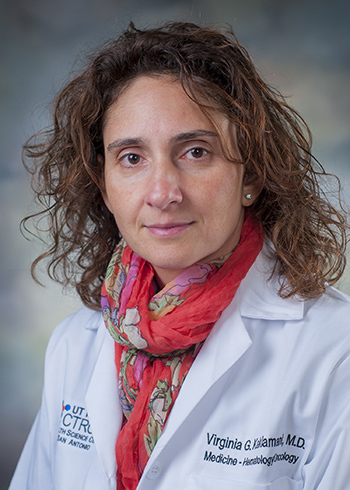 She was head of the Translational Breast Cancer Program at Northwestern University and co-director of the cancer genetics program at the same institution. Her research interests include studying high-risk families and identifying genetic mutations that are associated with an increased risk for breast, colon, and prostate cancer. She has identified several genetic mutations related to obesity which increase the risk of breast cancer. Kaklamani is a clinical investigator with expertise in designing clinical trials with targeted agents.